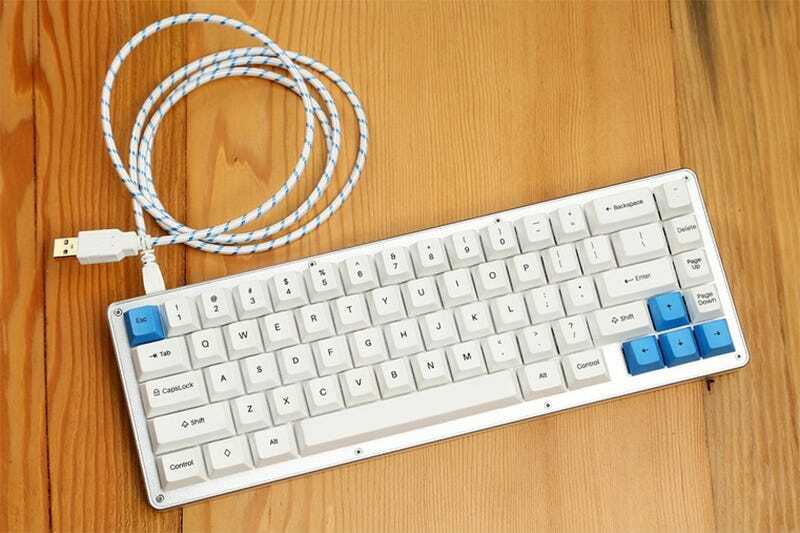 This is the WhiteFox, a custom 60 percent keyboard created by Matteo ”Matt30" Spinelli. A couple of years back this board was offered as a DIY kit on Massdrop, and over 4,000 kits were sold. Now Matt30 and the folks at Input Club are offering the WhiteFox once more, fully-assembled for the masses. Working together with the folks at keyboard enthusiast group Input Club and group buy website MassDrop, Matt30's initial launch of the WhiteFox was a massive success. It quickly became one of the most coveted small form factor mechanical keyboards going. Now Matt30 and Input Club have teamed up to offer the board via Kickstarter. The $100,000 campaign kicked off earlier this morning, with fully-assembled boards a reward for pledging $159 t0 $169. As of this writing they’ve just surpassed the $30,000 mark, with no signs of slowing down. Massdrop is a great platform with a huge user base but of course you have to compromise when dealing with big companies. BUT. The WhiteFox is our baby, Input Club and I felt that we couldn’t keep compromising and we needed a way to finally release our keyboard the way it was always meant to be. Folks in the mechanical keyboard community have been clamoring for a new release of the WhiteFox since the initial kits launched in late 2015. The board is the ultimate result of Matt30's personal journey to create what he considered the perfect keyboard, something compact enough to reduce hand movement while still maintaining functionality found in bigger boards, like the signature offset arrow keys. It had to be fully-programmable. It had to feel just right. Considering the overwhelming response, he nailed it. While the initial kit release of the WhiteFox gave users multiple layouts to build, the Kickstarter is strictly what they call the “TrueFox” layout. There are several switch options available, including the two new types created by Input Club for their recently-launched K-Type, the Halo Clear and Halo True switches. If you were interested in custom keyboards but nervous about building your own, the WhiteFox is an excellent example of what can be accomplished. Check out Input Club’s page on the board for more info.